The car was bought back in 1993 when I saw it in the paper for sale. I went and had a look at it, it was a mess! 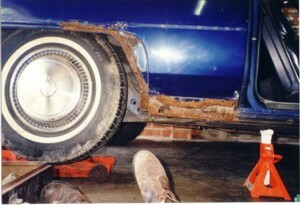 It had extensive rust, needed rechroming, paint, interior mechanicals the LOT! But the RHD conversion was already completed so we (my brothers) all thought this car had potential to be something special when restored. A deal was struck and the Caddy made its way back to our house, we didn't even no if it would fit in the garage! Luckily it did by inches! That summer the whole family got stuck into the restoration of this classic. It started with stripping of the chromework and cutting all the rust out and smoothing all the panels. My brother Frank did all this work as he's a qualified panelbeater. Me (Roy) and my other brother Tony helped with grinding etc. Once straightened the car was sent off to be painted at a local smash repairers that had a big enough spray booth to fit it in! (lucky they paint trucks as well). Once painted we got the car back partially assembled. We then ordered all the required parts needed from the USA and from some local suppliers. The car was completed with the original interior (it was faded but still ok). It was first registered in October 1994 and was used for my Year 12 Formal! When it was registered we were told by a guy at the RTA that if it was 1 foot longer it would have to be registered as a light commercial!! A few years passed and car stayed in this state, being used only once a week. Then came 2002. I decided it was time to get the interior up to the same standard as the rest of the car. So out it all came, down to nothing! 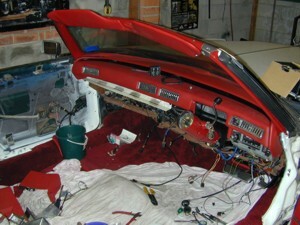 Angelo (our auto electrician) was given the task of going through the wiring and replacing and checking it all. The dash etc was sent off to be rebuilt while the seats and trims were sent to the trimmer. Brackets were remade, some parts were sent to Melbourne to be refreshened, like the woodgrain door trims and steering wheel. Then the task of putting it back together was a slow process as I'm very fussy! Finally it was finished just in time for the Panthers Bridal Expo in June 2003. The car went from being a mess to the stunner it is now. We do not know much about its past, but we do know it was sold new in California. I'd like to have its history traced (can anyone on here help?) and look forward to hearing if it had a brush with fame in the USA. There are a couple of things I still have left to do it - when does it end? Recently I sourced a set of parade boot covers including the hard to find backing plates for the locking pins from Keith Deen in QLD. The locking pins I sourced from the USA whilst looking on www.ebay.com . For those of you that haven't tried eBay for Caddy parts I would recommend it as I have found some hard to get parts on there and at very good prices!